Is privacy essential to your data storage? Do you work in a commercial company or have your own enterprise? Fortunately, a new in-demand USB flash drive, the SPYRUS Secure Pocket Drive is now available to address your specific concerns. Finally, after a year of use by government entities, SPYRUS—which holds patents in the U.S. and other countries that allow secure authentication, secure communication and full disk encryption—the secure flash drive is now available to commercial markets and businesses around the world. The SPYRUS Flash Drive is the first and only licensed device that carries Microsoft’s mobile operating system, Windows Embedded Standard 7. The read-only device can be booted from almost any PC. It has been created with the users in mind, so they can have an intuitive, breezy experience while feeling secure about their data. Once plugged into a USB port, the encrypted flash drive only utilizes the host PC’s RAM, keyboard, mouse, and monitor. Once you open your computer with the Windows USB stick inserted, you are prompted to enter your encryption or password. However, if the Secure Pocket Drive finds a potential security compromise on the system, it will not boot. The device is guarded with a strong FIPS 140-2 Level 3 Hardware, with next-generation cryptographic algorithms, and a built-in self-checking functionality. Once you get through decryption, the computer will continue booting and you will then see that your wallpaper, no matter what it is, will be replaced by a blue background with the huge text “SPYRUS” written on it. While these security measures work busily behind the scenes, browsing feels the same as it does with any ordinary drive connected to a system. The owner of the host computer will also feel secure since there is no way that any virus (such as the usual Autorun viruses and other malware) from the USB drive may enter the PC. Furthermore, aside from the built-in browsers and Citrix XenApp client, you may easily add virtual private network (VPN) software that allows you to securely enter internal corporate applications. To update software, user can use Microsoft System Center Configuration Manager (SCCM) and Active Directory policy settings. And if ever the device is stolen, the SPYRUS Enterprise Management System (SEMS) can remotely disable the SPYRUS Secure Pocket Drive. When you’re finished with whatever it is you were working on, simply shut down the PC as normal. Once you re-open it, you’ll see that there are no marks of using the SPYRUS USB flash drive at all (i.e. your original wallpaper will return). Now, small, medium and large enterprises do not need to issue their employees a laptop or an unsecure office flash drive. Unfortunately, since it isn’t for sale to the general public, it may be impossible to find it at your favorite IT store. Prices for the encrypted flash drives have yet to be revealed, however, companies may start contacting SPYRUS for wholesale buying. Do you think this device should also be sold to individuals? Why or why not? Let us know your thoughts! 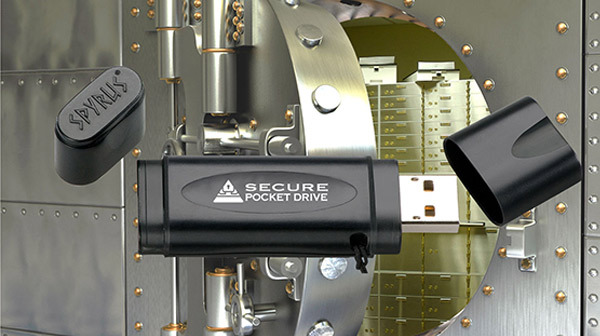 This entry was posted in Articles, Secure Pocket USB Drive, SPYRUS, USB Devices, USB Security Device and tagged encrypted flash drives, secure flash drive, Secure Pocket Drive, Secure Pocket Drive from SPYRUS, SPYRUS, SPYRUS Flash Drive, SPYRUS Secure Pocket Drive, SPYRUS Secure Pocket USB Drive, USB security device. Bookmark the permalink.